In numerology, the number four represents structure, manifestation, stability and foundation. Some key words for the four of swords are rest, time-out, meditation, relaxation and standstill. It looks like due to all of the heartbreak experienced with the three of swords, it’ time to take a rest, meditate and relax! When the four of swords appears in a reading, it indicates that it’s time to take a much-needed rest to still your mind and contemplate your next moves. However, be advised that once you are rested, you will return to the world to face the normal everyday challenges of life. When the four of swords appears reversed in a reading, it indicates that the individual’s main focus is on the everyday challenges of life. The individual finds it difficult to make time to rest, meditate, relax and rejuvenate themselves because the person is caught up in certain thinking pattern which keeps that person stuck doing the same things over and over again. 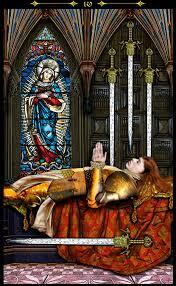 Want a more comprehensive interpretation of the 78 tarot cards which includes the four of swords. I highly recommend “The Ultimate Guide to Tarot Card Meanings”, by Brigit Esselmont. This entry was posted in Suit of Swords and tagged The Four of Swords. Bookmark the permalink. Princess of Swords - Inquisitive & Communicative Mind! Four of Wands - Harvest! Happy 1 Year Anniversary Kim's Esoteric Tarot Journals!